Genomic testing has become an important tool in unlocking the genetic cause of many rare diseases and helping provide a diagnosis for patients and their families who have often spent years searching for answers. But many physicians, especially those in underdeveloped countries, do not have training in medical genetics or the resources to access genomic testing. As a result, these physicians are limited in the care they can offer their patients with rare disorders, many who suffer from multiple medical problems. Physicians and researchers in the Mayo Clinic Center for Individualized Medicine are working to bridge these gaps through education by sharing their expertise in applying genomics to diagnose and treat rare diseases with physicians worldwide. 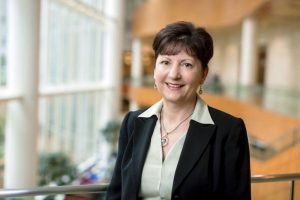 As part of this educational effort, Dusica Babovic-Vuksanovic, M.D., joined 58 genomics experts from around the world at the International Summit in Human Genetics and Genomics, hosted by the National Genome Research Institute at the National Institutes of Health (NIH) campus in September. The summit was the second in a five-year (2016-2020) Trans-NIH initiative to advance genetics and genomics in research and medical practice in low to middle income countries. In the past two years, the summit has trained 45 medical professionals from 37 countries. “Many practicing physicians in underdeveloped countries do not have the luxury of ordering a genetic test and getting results of that test when faced with a patient with an unrecognized or undiagnosed disease. Our goals at the Center for Individualized Medicine align with those of NIH and the summit organizers to bridge the gap in genomic knowledge and improve precision medicine care worldwide." - Dusica Babovic-Vuksanovic, M.D. At the summit, Dr. Babovic-Vuksanovic shared her expertise in caring for patients with neurofibromatosis, a genetic disorder that affects one in 3,000 people and causes tumors to form on nerve tissue. The disease is characterized by development of neurofibromas, tumors that can grow anywhere in the nervous system, including the brain and spinal cord. In addition, patients with neurofibromatosis have other complications affecting the nervous system, bones, vision, skin and cardiovascular system. Multispecialty management within highly specialized clinics, like one at Mayo, is extremely important. “Many summit participants see patients that have clinical signs of a genetic disease like neurofibromatosis, but they are unable to confirm their diagnosis with genomic testing in their own clinic or area. Summit participants were very interested in learning how genomics is used to diagnose patients with neurofibromatosis as well as how they should manage the many complications that these patients experience, including hearing and vision loss, learning impairments, heart and blood vessel problems and severe pain,” says Dr. Babovic-Vuksanovic. Dr. Babovic-Vuksanovic, a consultant in the Department of Clinical Genomics, heads Mayo Clinic’s Neurofibromatosis Clinic, which offers specialized multidisciplinary care for patients with all forms of the disorder. Advance genomic science to the global community. Identify and fill the knowledge gap in genetics and genomics and their related technologies in developing nations. Promote genomic research and medicine through international cooperation and collaboration. Save the date for next year’s Individualizing Medicine Conference. It will be held September 12-13, 2018 in Rochester, Minnesota.